Confederacy, Confederate Counterfeit Cover Collection, reference group of over 170 covers with an additional 60+ stamps on stock and albums pages, encompassing both Postmaster Provisionals & Regular issues; Provisionals including the Marion, Va. 10¢ & 20¢ imprints on unused patriotics, similar Charleston S.C. 5¢ & 10¢ imprints, 5¢ Grove Hill stamp on illustrated cover, 5¢ Emory, Va. use, 5¢ Statesville, N.C. unused entire ex-Ferrary (with an auction write-up), 5¢ Knoxville entires by Petrie, etc., as well as a few other crude more modern type fake items, Regular issues with a myriad of both genuine and fake stamps used on sometimes genuine covers, including multiple and mixed frankings usages, bisects, patriotics (with both genuine and fake designs present), POW, corner card covers, turned and other adversity, perf'd, etc. ; a comprehensive group. 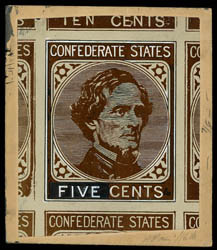 Confederacy, Confederate Fake & Counterfeit Reference Collection, several thousand stamps mostly on albums and stock pages; starting with the array of Postmasters' Provisional with creations from all the notable facsimile makers including Taylor, Upham, Scott, Petrie, Moens, etc., including the Brewster Kenyon 5¢ Lynchburg reprint sheet of 4 with 1927 signed letter to E. Knapp and 1929 Knapp notes, additional Kenyon reprint proof signed Carter Glass, Marion posthumous reprints and bogus types, well represented Mobile and Nashville facsimiles, Richmond including bogus City Post issues with very early types, bogus including 4 St. Elmo, Tenn. strips of 6 (one signed MacBride as fake), Florida Express types, section of 6 forgeries on cards each sign "Cft." 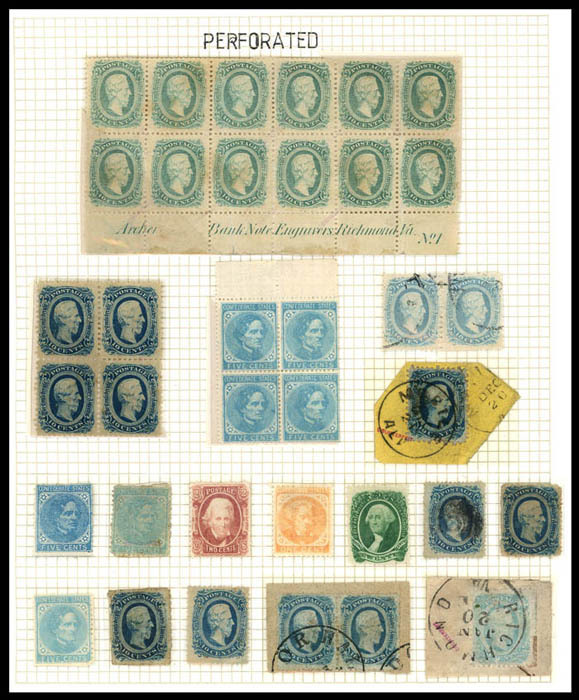 by August Dietz, etc., Regular issues including a interesting section on the 10¢ Jefferson altered plate including a pane of 30 signed by H.A. Diamont to E. Knapp and endorsed "From the original plate", also a complete sheet of the 5¢ N.Y. fake, 2¢ altered plate reprints, extensive showing of each issue with various forgeries with many scarce items, "proofs", section of the 1863 2¢ red brown with fake cancels including Sperati N.Y. cancels, section of Perforated including a 10¢ plate block of 12, etc. ; a wonderful collection and certainly an excellent basis for continuation. Confederacy, John A. 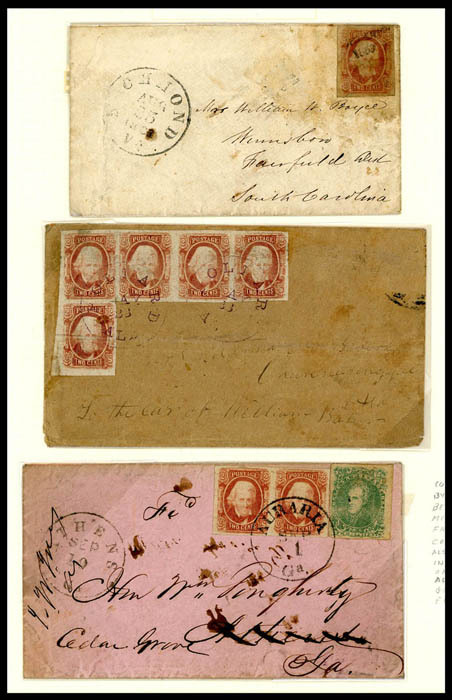 Fox Covers, group of 12 covers and two on piece items, mostly genuine stamps tied by fake postmarks; includes 2¢ (3) drop from Scottsville, Va., 5¢ (7) strip tied by Anderson, Tex. cds's on turned cover, 10¢ (2) on embossed ladies cover from Galveston, Tex. and pair use with patriotic label tied (similar 5¢ (4) usage), several patriotic including captured Lincoln, Adams Express oval use, 2¢ (8) tied by red Petersburg, Va. cds, forged #99XU3var. 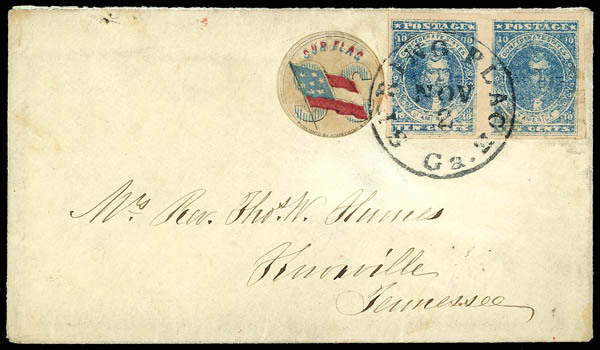 usage, off cover with genuine Atlanta Provisional cut with 5¢ (1) affixed over and fake cancel applied, etc., Very Fine appearance. 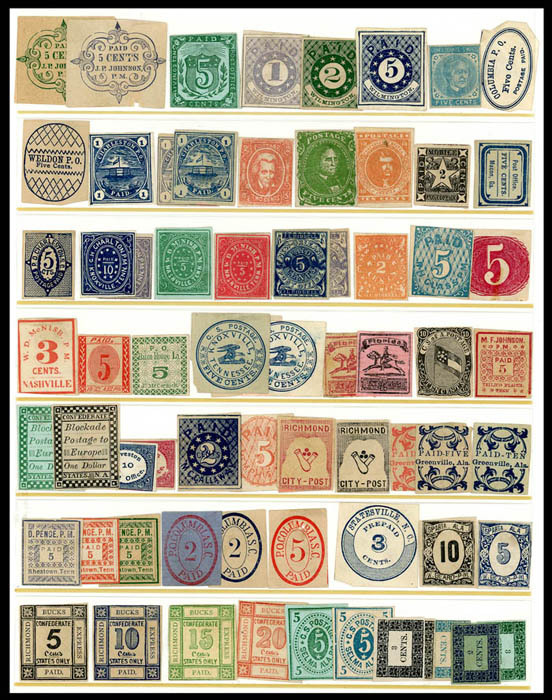 Confederacy, Samuel C. Upham Facsimile Sheets Collection, of 21 sheets and an additional 31 individual plating stamps; includes complete sheets of six (with Upham imprint) of the Provisional 5¢ Baton Rouge (2 sheets), 2¢ & 5¢ Memphis, 5¢ Mobile, 5¢ Nashville in red and gray, New Orleans 2¢ blue and red and 5¢ brown, Regular issue with 5¢ green and blue (with and without imprint), 10¢ red and blue in sheets of 12 and in 6 with imprint (blue sheet of 12 with top 6 stamps inverted), and later 1863 10¢ design tête-bêche sheet appears to be Upham. Samuel C. Upham starting selling his creation in 1862, only one year into the Civil War. 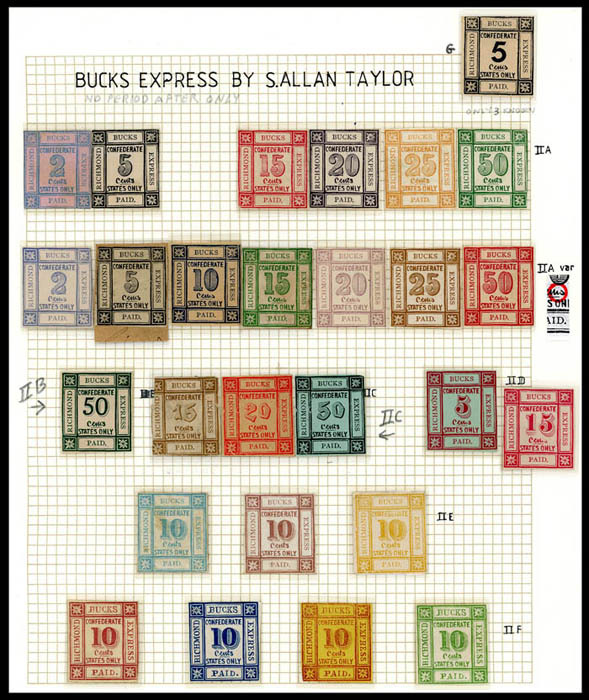 Confederacy, Bucks Richmond Express Collection (a bogus S. Allan Taylor creation) of 69 stamps mostly arranged by type on album pages; includes a rare solid "5" example and a modest backstock. Confederacy, S. Allan Taylor Confederate Packet Collection, of 68 Taylor facsimiles, including regular, provisional, and bogus issue creations given to a beginner collector in 1898, includes a Taylor price sheet for his various packets including CSA stamps and a personal 1969 letter from Harry F. Rooke regarding these stamps and mentioning a few new types. Confederacy, Springfield Facsimiles Collection, production collection housed on album and stock pages in binder; includes four original proof designs (1862 5¢ & 1863 20¢ on board backing with original touch up and 1863 10¢ with and without frameline on thin glazed card, original photographic proof set-up of 25 for the original plate of the 1862 5¢ and 1863 10¢ issues, final black proofs in thin glazed in blocks and sheets for 8 different issues with additional, few other additional photographic proof items, complete set of original Springfield sheets with additional, Tasco booklet and Tatham Co. return label, etc. ; a fascinating group. 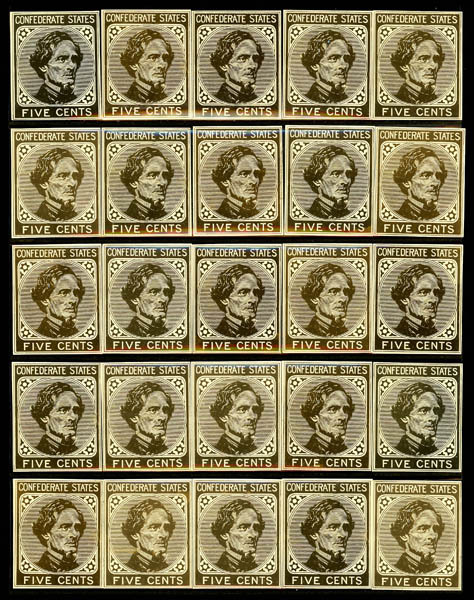 Beginning in the mid 1930's, a set of 14 counterfeits of the Confederate General Issue stamps were made and sold by a stamp dealer in Springfield, Mass. 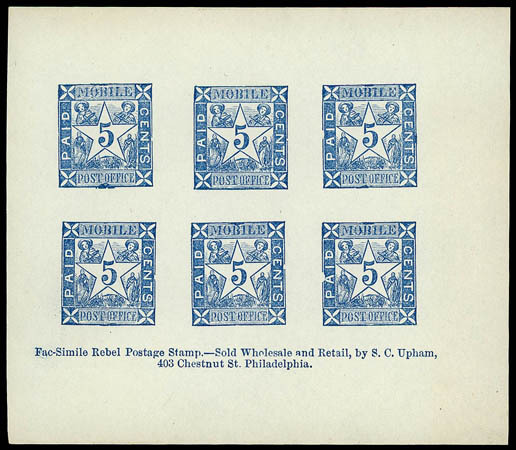 These facsimiles were also used in the TASCO Booklets prepared in 1941 by the Tatham Stamp Company of Springfield, Mass. 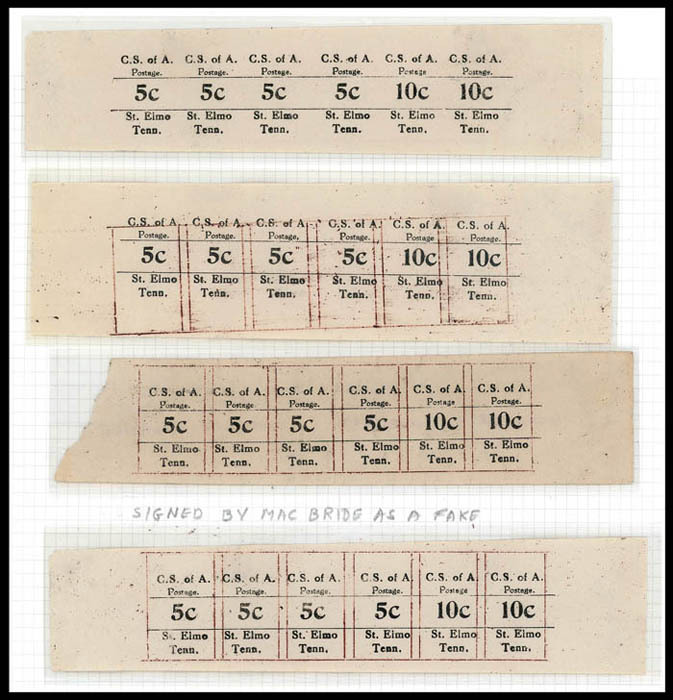 In order to make the counterfeits, a set of original drawings made by August Dietz in 1919 were used. The drawings were copyrighted, and the use of these drawings was done without the permission of August Dietz.